Being a dual sport player on the collegiate level is probably something most college freshman wouldn’t hope to achieve regardless of their athletic talents. But, for a 22-year-old native Hawaiian, Lone Peak High School graduate, and Brigham Young University (BYU) freshman named Jacob Hannemann, it seems like the most natural thing to do. From a very young age, Jacob has always had a keen interest in sports. He was born in Kahuku, Hawaii, and when he and his family lived there, he enjoyed riding the waves on his surf board. As a sportsman at BYU he has gained considerable recognition as an all-around athlete. He plays the position of outfielder for the Cougar’s baseball team, and defensive back for the Cougar’s football team. Jacob is the son of Howard and Mindy Hannemann. His younger sibling, Micah, also plays football for the Cougars, and his brother Kyle signed a 2011 football letter of intent to play for Southern Utah University. He is a member of The Church of Jesus Christ of Latter-day Saints (inadvertently referred to as the Mormon Church by the media and others), and served a two year full-time mission in the Arkansas Little Rock Mission. He is also an Eagle Scout. Before his glory days as a dual-athlete at BYU, Jacob had already gained considerable acknowledgement as an outstanding athlete when he was a student at Lone Peak High School in Highland, Utah. In baseball he maintained a batting average (the measure of a batter’s performance obtained by dividing the total of base hits by the number of times at bat, not including walks) of .450. In 2009 as a member of the Lone Peak Knights football team, he helped to lead the school to an overall record of 9-3. During his high school football days he had a total of 33 tackles with four interceptions. He had five or more tackles in four games. He also had 19 receptions for 380 yards and seven touchdowns, and rushed three times for 20 yards on offense. And he recorded a season-high 137 yards with two touchdowns against American Fork. It is no small wonder that he was voted as the team’s MVP. Jacob graduated from Lone Peak High School in 2010. By the time he had graduated he had already signed a letter of intent to play football for BYU and he was also preparing to serve a two-year mission for The Church of Jesus Christ. At the same time, the Kansa City Royals had also taken a keen interest in his athletic abilities and were interested in having him play for their team. After just three days of working out with the Royals, Jacob became a draft prospect, but having just graduated high school, he was uncertain as to which direction his future should go and wanted to keep his options open. The offer placed on the table by the Royals was $250,000 which included a $125.000 cash sign-on bonus, and a four-year scholarship to the college of his choice. Although that was a considerable amount of money for just starting a baseball career, Jacob still had some major life decisions to make. One of those decisions was whether to pursue a baseball career or serve a two-year mission for The Church of Jesus Christ. “It was really hard,” Hannemann said. “I know that I could still have a chance to play in the future if everything works out. It’s a great opportunity. But what I’m saying is I feel I need to go serve a mission first before any of those opportunities come around. It was tough because I felt like I was being pulled in both directions, so I really wanted an answer from Heavenly Father on what I should do. There was a time when I thought that the opportunity for me to play for Kansas City was a blessing for me and that’s what I should do. I was thinking that maybe He was giving me this opportunity and this is what I was supposed to do. However, the conversation between Jacob and the Kansas City Royals did not end there. The Royals even made “a bizarre option [for Hannemann] to be assigned to the franchise’s low-level team in Arkansas where he could proselytize during the day and play ball at night. The family explained to the organization that wasn’t really an option.”  The Royals finally ended the conversation by stating that they respected Jacob as a person and his decision, but admittedly, they did not understand why serving a two-year mission for The Church of Jesus Christ was more important than playing professional baseball. They may not have understood, but Jacob and his family understood completely. While serving his mission in Little Rock, Arkansas, Jacob shared with people how he had been drafted to play major league baseball straight out of high school, but had decided that serving a mission first was top priority. 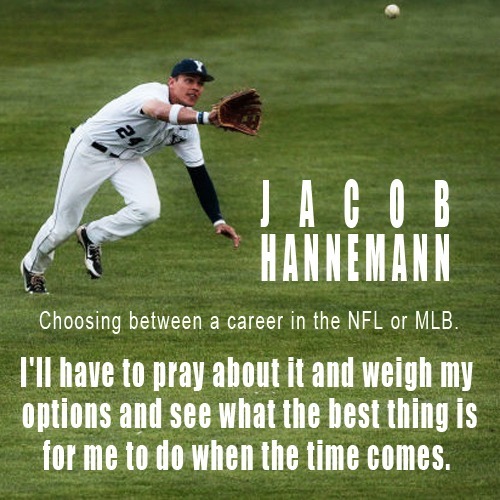 On Friday, 7 June 2013, Jacob Hannemann was selected by the Chicago Cubs in the third round of the Major League Baseball (MLB) draft. He was picked 75th overall, the second pick of the third round, which is higher than had been predicted. And so it appears that his days as a two-sport all-around athlete have come to an end.